Snow day number 4 today here, hope you're all managing to stay warm and aren't suffering too much with cabin fever! 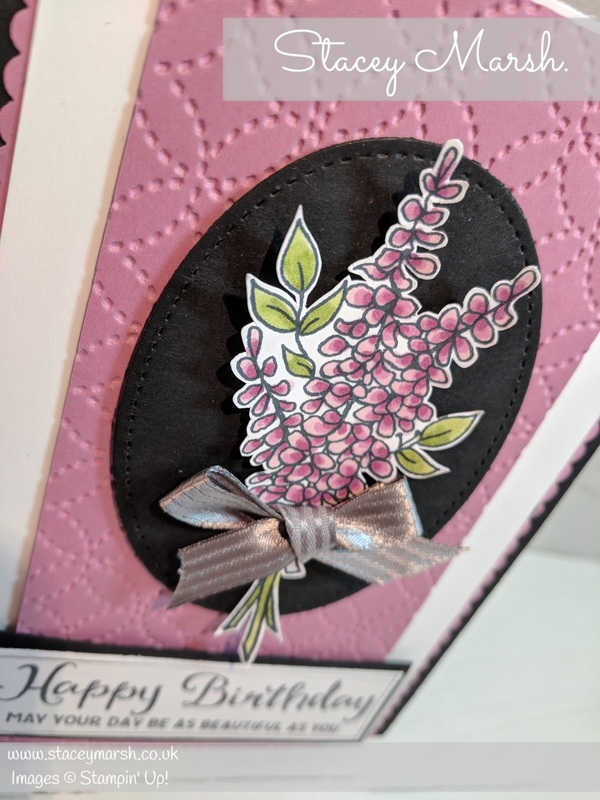 Since the start of this years Sale-a-Bration promotion, I have seen so many cards and projects all over Pinterest, Facebook and Instagram using the FREE Lots of Lavendar Stamp Set, however it wasn't one that I went for straight away. After using at team training in February, I bit the bullet and finally ordered it and I can't get enough! This card has been cased from the main project that we made, so thank you to Michelle Last! Basic Black Card base measures 4, 1/8" x 11, 1/2", scored and folded at 5, 3/4". Underneath the Whisper White layer, I have cut 2 strips of Sweet Sugarplum Cardstock using the Decorative Ribbon Border Punch. 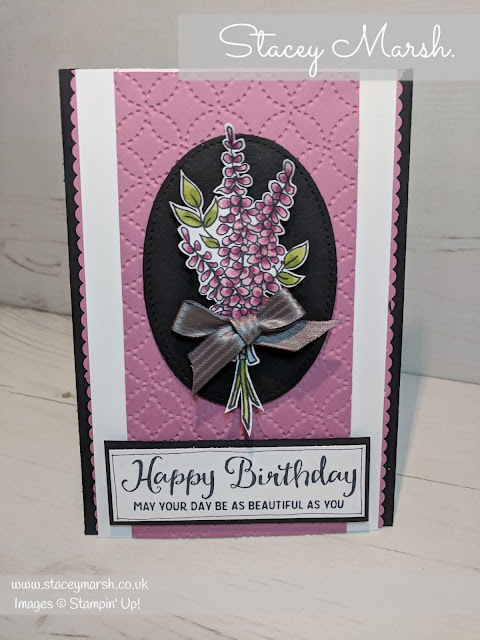 I have used the Quilt Top Textured Impressions Embossing Folder on a piece of Sweet Sugarplum Cardstock and attached to the card. For the oval shape, I have used the Stitched Shapes Framelits. The Lavender image has been stamped onto Whisper White cardstock, and coloured using Stampin' Blends (Pink Piroutte Light and Dark, Rich Razzleberry Light and Dark, Crumb Cake Light, Old Olive Light and Dark). I have cut around, and attached to the oval shape using Stampin' Dimensionals. I have tied a bow using Basic Gray 3/8" Stitched Satin Ribbon and secured using Mini Glue Dots. The sentiment that I have used on this card comes from the Beautiful You Stamp Set. I have stamped this onto a piece of Whisper White cardstock, mounted onto Basic Gray cardstock and attached using Stampin' Dimensionals.